Every year I hear the same things from friends and family: “do you have a Christmas list yet?”, “You have to send me your Christmas list.” And, I usually reply with “I’ll come up with one, I’m not sure what I want this year.” Which is often true, but only because I have an awful memory. Even though I have spent the past two months pointing out things that I want for Christmas I always end up forgetting about them. So, I needed an easy, fun, and interesting way to share my Christmas list. I initially tried adding links to the items that I wanted on Twitter with the hashtag #christmaslist. This would allow my friends and family who were following me to see what kinds of things I wanted this year. But, it didn’t end up working out very well. Not enough of the people asking for my list even used Twitter and it often meant that those asking for my list had to search for and compile the list for themselves. So, I came up with another solution: Photo Stream. The same service that my sister and brother-in-law have been using to share pictures of their children was going to be my wishlist service. It’s a simple idea that worked out much better than using Twitter and happened to be easier for me to actually do because it felt more like a fun project than the tedious task of compiling a list links. Whether I find an item online and take a screenshot or take a picture of an item in a brick and mortar store, adding it to my Photo Stream is incredibly easy. Dropping it into iPhoto and clicking share or tapping the share button on my iPhone was super easy. All that’s left is adding a brief description about the specifics (size/color), the price, and either a link or a list of places where it could be purchased. Now the iPhone owners in my life can just open up the Photos app to see my Christmas list with information about where to purchase and how much they’ll cost. And because I’m able to add and remove photos from the stream, they will always have my most recent list of items that I want. One of the key things I wanted with my wishlist system was the ability to add things to it. I have a hard enough time coming up with just a few things to put on my list and if I ever had to add to it I would have to send out an email with new items that I’ve found. But, I always hate receiving emails like that because I would prefer one place to look when shopping for a person and emails like that mean that I have to compile the list myself and save it in a notes application. 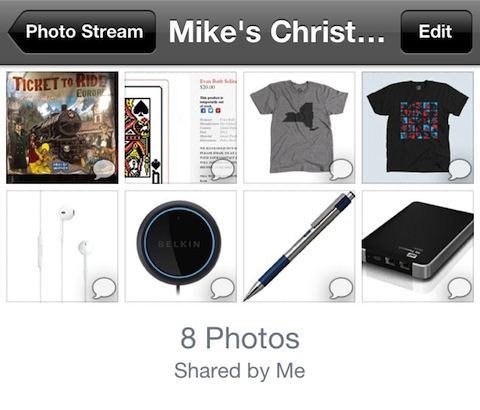 With Photo Stream, all the things I want are in one place that can be easily updated. But, by far the best part about using this system is that not just iPhone owners can make use of it. Because of Photo Stream’s public website feature I can just send out a link to everyone who wants it but doesn’t have an iPhone. The only downside I’ve found with this is that the public website only displays the initial comment made when you first upload the photo, so any questions that others’ ask that are answered in the comments aren’t included. But, that’s a small price to pay for what I consider to be the best way to share a Christmas wishlist with friends and family.